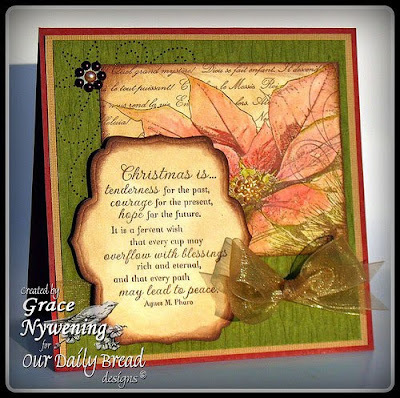 Here is a card I made using Our Daily Bread design's new Dec. release, The Gift, designed by Dina Kowal. The detailing on this big poinsettia is gorgeous! It's a great stamp alone image, but also looks great colored, glimmered up, and any other way you can think of presenting it. This card is on a base of Cranberry Crisp, layerd with Bazzill textured caramel, then The Paper Studio textured olive designer paper. The image is stamped with Chocolate Chip on Very Vanilla, ever so lightly watercolored with inks and sponged around the edges with chocolate chip. The sheer ribbon is from my stash. I used a piercing template from Ornare and added some liquid pearls and bling from BasicGrey. Fast and easy! I hope in the busyness of the season you are taking time to ponder the wonder of the Gift God gave us in His one and only Son, who humbled Himself and came to this earth as a baby and lived among us, being rejected by those He loved, and eventually put on a cross to die.... to pay the penalty of our sins so that we could be reconciled to Him and spend eternity in heaven with Him when this life is over. There is no greater gift than this! I hope you can bask in the wonder of it all, and be filled with the Joy and Peace that only He can give! This poinsettia is beautiful....one of my favorite colors, too!! Love the vintage look of your card, Grace!! Grace, I love the intricacies and fonts of the ODBD stamps, and this is no exception!! The sentiment is so meaningful as well, and you did a wonderful job showcasing the true meaning of Christmas. I love what you wrote as well, thank you for sharing! This is stunning Grace!! I love the pink poinsettia, your color combo and the design with the punches. So elegant my friend!! So very beautiful, Grace!! Your coloring is just stunning, and love how you added the sentiment!! This is sooo beautiful Grace...OOO I love your added peircing its stunning! What a gorgeous card, and yes Jesus is the reason for this season.. This is beautiful Grace. I love the colors.. They are so soft and nice together.. The sentiment is probably one of the best I have seen for the holiday season..Super job. Absolutely stunning! God's gift is the greatest of them all! 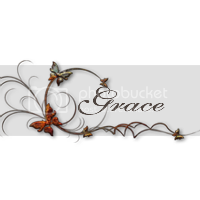 Awesome message in your post today! Your card is so pretty! How did you get the snow falling?? So pretty, love the sentiment and the little pearls are the perfect accent. This is gorgeous Grace! I love the colors you chose...so vintage Christmas and very comforting! Soooo pretty! Have a very merry Christmas!